I’ve probably blogged about this place before, but it’s always worth another plug…. We took Leigh’s Mum to one of our favourite beaches, at Traders Cove. It’s a little out of the way, but we had the beach to ourselves, from 2pm until about 7pm. We cooked sausages on the fire pits they have there, swam round the "spit" to the left and snorkelled in the bay. But when the flies and mozzies arrived it was time to vacate the beach! Take a look at the Flickr page, for a larger version of this picture. …. 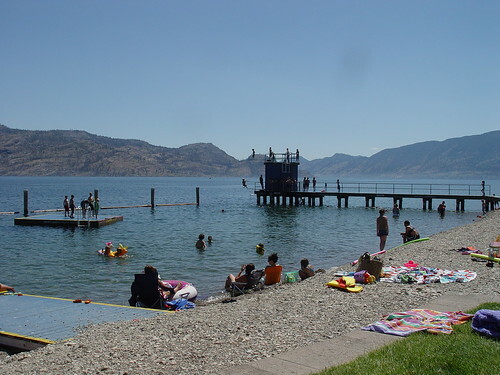 and in Penticton, BC! So, the long story is this. 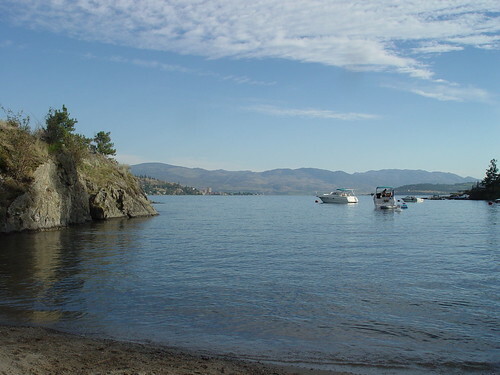 We went for a float down the channel connecting the Okanagan to the next lake to the south, Skaha Lake. 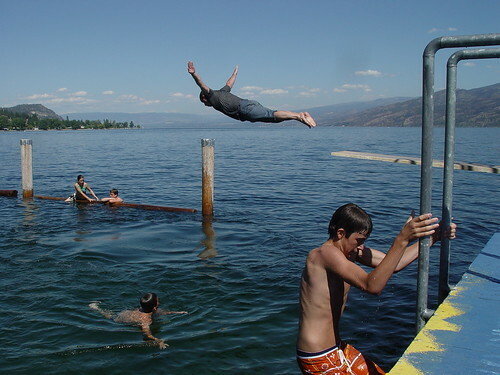 It flows through Penticton. 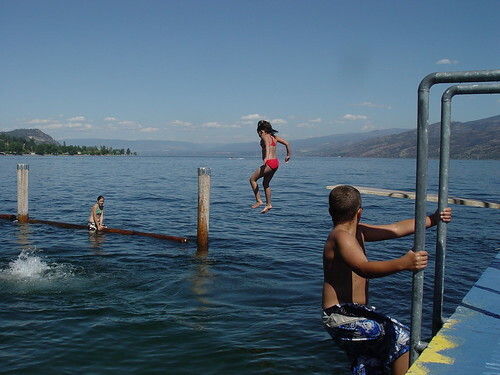 You can rent tires/tyres, or take your own inflatables, you pay your $4 for the bus back and you get in at the top end of the channel at the south end of the Okanagan. It takes about an hour for the trip, but when you are lazily floating past groups of people tied together with ropes, in inflatable chairs with blow up cool boxes full of beer, you know you need to take your time. Or you could don a snorkel or diving gear, and float down trying your luck at “treasure hunting”. One guy was doing it as we drifted along and discovered an almost new pair of Oakley sunglassess, along with a tent pole…. “You never know when that’s going to come in handy!” was his response. Wouldn’t have minded the sunglasses though. “You’d be amazed at the things people have dropped.” he said. Anyway, at the end of the “ride”, as you climb out of the river, there is a cafe and this guy, Relvis! he was here last year we did the channel and he apparently does his thing 3 times a day, 6 days a week to a captive crown as we waited for the bus back. 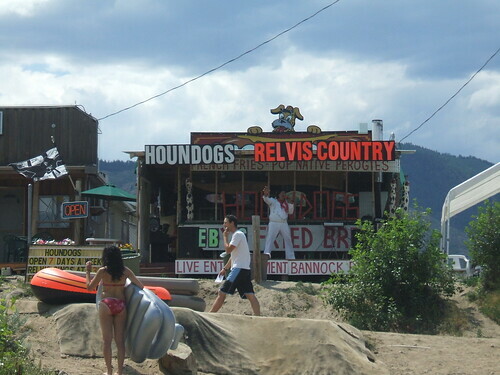 Viva Las Vegas!, erm… Penticton…. Last year, it was t-shirts, this year, it’s blogs and websites. With nothing much to do, (although he’s left me with the task of sorting out some of the coding, while he pops down the beach with a friend! ), Samuel is launching a new site, based on ice hockey, the Canadian passion. It’s in it’s early stages and we are starting it small, to test the water, but feel free to visit it, from time to time, to get your fill of the upcoming season and updates weekly, up until the Stanley Cup in 2008. So, head on over to IceHockeyWorld (http://icehockeyworld.blogspot.com) to see what’s happening…. The temperature was in the high 30’s, so the thermometer said. So, with the day off on July 4th, for US Independence Day, where better to go when the sun is out…. the beach. There’s no sand but the water is clear and the grass and stones are free from geese poo, which is nice! Plus there are more families on this beach and it’s free parking literally to the left of the photo on the road. It’s never so busy that you can’t park. 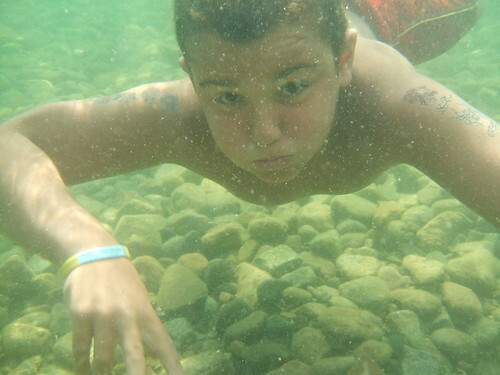 Sam was straight in, diving off, trying to impress the girls, with his diving prowess and his tan…. After having to throw her in, as she wouldn’t jump, we couldn’t get Holly off of the low diving board. She spent the next 5 hours, jumping in, climbing out, jumping in, climbing out, taking time now and then to try her luck in chatting the life guard up…. And then I had a go. The grace, the style, what more can I say…. flying like an eagle. I’m not sure what my arms are doing though, ‘cos I’m not aware of them doing what they are doing at the time…. Favourite shot of the day, check the arms again and the legs. They were tight together when I hit the water though. I made that mistake last year…. 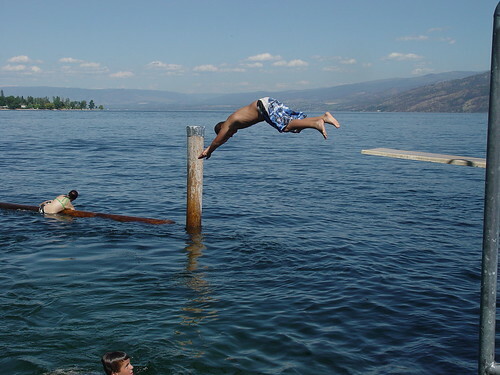 Yep, that’s me off of the high diving board. After seeing a kid of about 5, leaping off, I felt embarrassed not to. Of course, I then had to have another go. Still, we’re all kids at heart ain’t we, and as the song said, “Do something each day that scares you“…. So all in all, a mighty fine day was had. We’ll be back here again before the month is ended, probably at the weekend!